Intuitive Analog Circuit Design outlines ways of thinking about analog circuits and systems that let you develop a feel for what a good, working analog circuit design should be. This book reflects author Marc Thompson's 30 years of experience designing analog and power electronics circuits and teaching graduate-level analog circuit design, and is the ideal reference for anyone who needs a straightforward introduction to the subject. In this book, Dr. Thompson describes intuitive and "back-of-the-envelope" techniques for designing and analyzing analog circuits, including transistor amplifiers (CMOS, JFET, and bipolar), transistor switching, noise in analog circuits, thermal circuit design, magnetic circuit design, and control systems. The application of some simple rules of thumb and design techniques is the first step in developing an intuitive understanding of the behavior of complex electrical systems. Introducing analog circuit design with a minimum of mathematics, this book uses numerous real-world examples to help you make the transition to analog design. 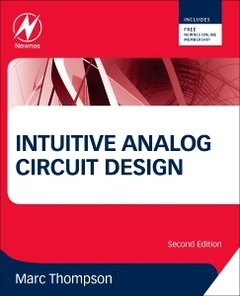 The second edition is an ideal introductory text for anyone new to the area of analog circuit design. Dr. Thompson specializes in custom R/D, analysis, and failure investigations into multi-disciplinary electrical, magnetic, electromechanical and electronic systems at Thompson Consulting, Inc. (Harvard MA). The author is also Teaching Professor of Electrical and Computer Engineering at Worcester Polytechnic Institute. He teaches graduate-level and undergraduate seminars in analog, power quality, power electronics, electomechanics, electric motors, rotating machinery, and power distribution for high-tech companies. He has taught for University of Wisconsin-Madison, covering classes in electric motors, electromechanical systems, power electronics and magnetic design.